This soundbar sounds superb and it comes with a raft of welcome features. But it is pricey and it's lacking the odd feature that would have given it a perfect score. Not everyone has the space to erect a tubthumping 7.1 mega home cinema system in their living room, and with TVs and the sound they produce getting thinner every year, the soundbar is becoming a popular alternative. The Monitor Audio ASB-2 is a mightily impressive option, delivering excellent sound quality for movies, games and music as well as wireless compatibility with some of today's hottest gadgets. It's fairly large for a soundbar in all three spatial dimensions - 100.5cm wide, 16.7cm deep and 18cm high so you'll need to make sure you have somewhere to put it. But if your TV is wall mounted you have the option of paying an extra £30 for Monitor Audio's bracket and mounting the ASB-2 underneath. It costs £1000, hardly an impulse buy, but as we'll see it proves its worth with a raft of nifty features and excellent sound performance. Round the back, you're spoilt for choice in terms of inputs, with three HDMI 1.4 ports, HDMI-out with two-way ARC for the soundbar to share metadata with your TV, digital S/PDIF optical and coaxial as well as several auxiliary inputs for plugging-in any other audio gear. That HDMI-out is fully compatible with full HD 3D too, so we happily plugged in our 3D Blu-ray player to the soundbar and fed the signal on up to the TV that way. With most TVs only having three HDMI ports, those addiitonal inputs on the soundbar are super convenient. The connections transcend wires, with a multitude of wireless connection options available to hook up your laptop, phone or tablet. AirPlay Direct support means you can stream music straight to the soundbar from your iPhone or iPad without piggybacking on your home network. We set it up in seconds by pressing the connect button on the ASB-2, plugging our iDevice into the USB port on the back of the soundbar and then hitting Allow on the device. Setting up wireless control for a laptop was a lot more fiddly and involved fiddling around with web browsers, adhoc wireless networks and IP addresses. The manual has helpful instructions but this could all have been made so much easier simply by adding Bluetooth functionality instead - one of the only black marks on the ASB-2's roster of features. The lack of Bluetooth also means hooking up to an Android or Windows Phone device is frustrating and fiddly. You have to use DLNA over your home network to stream your music files to the soundbar, so if you want to stream Spotify to the ASB-2 from your Nexus 5, forget it. The sound is the most important part of course, so it's pleasing that the Monitor Audio ASB-2 sounds excellent. A total of 160W is delivered to various speakers within - two 5.5-inch subwoofer drivers, two 4-inch midrange drivers and two tweeters to tickle your nose hairs. You can tweak your soundscape using the excellent bundled remote control and the on-screen interface but even without changing any EQ settings, the sound from the ASB-2 is superb. Meaty, powerful, strong, consistent. Sound from Blu-ray movies in particular was truly excellent while music of all types sounds equally at home. The sound is not on a par with what you would get from a full home cinema system - of course it isn't - but from a device of this size I can't see anyone being disappointed. If you did want to boost it later down the line, there is an output on the back for connecting a subwoofer which would add a bit more power. 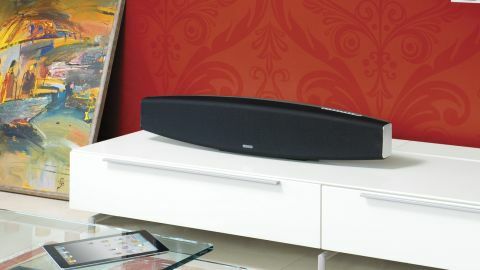 This is a fantastic soundbar offering superb sound for movies from a compact system. The sound is warm and rich and while shackled to the limitations of the form factor, never feels like it's under delivering. AirPlay Direct support is super-convenient if you own an iPhone, iPad or iPod touch but setting up DLNA and wireless networks to stream audio is fiddly and feels outdated - Bluetooth is the missing bullet that would have earned a perfect score for all-round perfection. There's also the price to consider, £1000 is a whopping £400 more than other options such as the Sonos PlayBar which offers less hi-fi credentials but far easier mobile device integration. It's up to you whether those extra pork chops are worth paying for.